To read last week’s post, see The week in .NET – 5/31/2016. Are you ready to rediscover .NET? Well, dotnetConf is back! Immerse yourself in the world of .NET and join our live stream for 3 days of free online content June 7 – 9 featuring speakers from the .NET Community and Microsoft product teams. Watch and ask questions after each session for a live Q&A. The live stream will be broadcasted on Channel9. There’s never been a better time to be a .NET developer. Learn to develop for web, mobile, desktop, games, services, libraries and more for a variety of platforms and devices all with .NET! We’ll have presentations on .NET Core and ASP.NET Core, C#, F#, Roslyn, Visual Studio, Xamarin, and much more. Take a look at our lineup of great speakers and sessions. We’ll have keynotes from Miguel de Icaza, Scott Hunter, and Scott Hanselman and a lot of great content from our community. For more information, check out our website and stay tuned to #dotnetconf & @dotnet on Twitter. Last week on the show, we had Lucian Wischik, Program Manager on the Managed Languages team at Microsoft, and concurrency expert. This week, we speak with Daniel Egloff about using the GPU in .NET. There are quite a few markdown libraries for .NET. Markdig is a fully extensible implementation of the CommonMark standard with excellent performance, both in terms of speed, and GC pressure. Expensya is a leading expense reporting app in Europe, Africa and Australia. Expensya is implemented in C# and runs on Azure, so when building the mobile app, they naturally decided to use Xamarin, that allows a high rate of code sharing, reuse of the team skills, cross-platform and client-server unit tests that validate the business logic end to end, and native-level performance. Thanks to Xamarin, Expensya mobile apps shipped on the three main platforms, in just a few months. The Florida .NET user group hosts a meeting on HoloLens Development with Unity and .NET on Wednesday, June 8 at 6:30PM at Octagon Technology Staffing@AXIS in Ft Lauderdale, FL. McDroid is a tower defense game where players take on the role of McDroid, an adorable android who is in charge of protecting the talkative space ship it crash landed with while it repairs the planet. 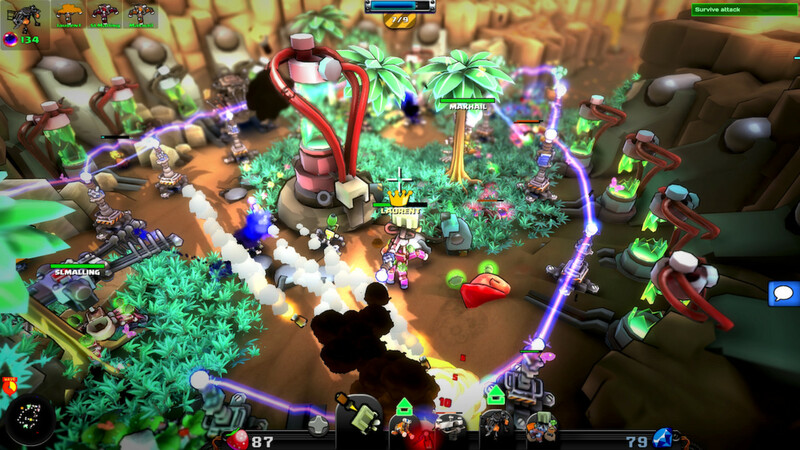 Players build up their base defenses while completing missions that often require harvesting resources and fending of several waves of aliens. Having excellent time management skills becomes key in order to progress to the next level. McDroid offers a story campaign, survival levels and a multiplayer survival arena. McDroid was created by Grip Digital using Unity and C#. It is currently available on the PlayStation 4, Xbox One and Windows (via Steam). More information can be found on their Made With Unity page. Inline IL ASM in C# with Roslyn by Alexandre Mutel. Strings and the CLR – a Special Relationship by Matt Warren. Use project.lock.json to troubleshoot dotnet restore problems by Andrew Lock. Windows 10 Anniversary Update Preview–Composition and the CompositionBackdropBrush by Mike Taulty. ASP.NET Core – problems and fixes by Michal Dymel. MSBuild Structured Log: record and visualize your builds by Scott Hanselman. Storing C# app settings with JSON by Piotr Gankiewicz. Async Programming : Unit Testing Asynchronous Code by Stephen Cleary. Imageflow: Respect the pixels, accelerate the web (Kickstarter) by Nathanael Jones. The .NET CLI Decoded by Sam Basu. Publishing and Running ASP.NET Core Applications with IIS by Rick Strahl. Introduction to integration testing with xUnit and TestServer in ASP.NET Core by Andrew Lock. Authorizing your .NET Core MVC6 API requests with OpenIddict and Identity by Kerry Ritter. Cloudscribe.Web.Localization – more flexible localization for ASP.NET Core by Joe Audette. ASP.NET Core RC2 (migration guide) by David Pine. Using XAML in F# Xamarin Forms – A Screencast, by Jonathan Wood. Custom error handling and logging in Suave, by Dustin Moris Gorski. Upcoming F# events – learn Suave, FsLab & more!, by Tomas Petricek. Fable: Super Fable Mario (Mario clone using HTML5 canvas). Join the Xamarin Team for dotNetConf by Joseph Hill. Xamarin DevOps with VSTS – Setup a Cross Platform Build Agent on OSX, and [Xamarin DevOps with VSTS – Setup a Cross Platform Build Agent on Windows] (http://www.blogaboutxamarin.com/xamarin-devops-with-vsts-setup-a-cross-platform-build-agent-on-windows/) by Richard Woollcott. Watch Kent Boogaart code WorkoutWotch from start to end. Xamarin DevOps with VSTS – Getting Started by Richard Woollcott. Serialization, Monobehavior Constructors and Unity 5.4 by Lukasz Paczkowski. Breakout! How to Stop An Infinite Loop in a Unity C# Script by Peter Andreasen. Build a Unity Game Part 4 – Video, by Stacey Haffner. Unity Linear Interpolation, by Indiedevart.